You are looking at many power supply circuit diagram. The various electronic projects need to use them as an energy source. There are a lot of circuits categories: power supply. But sometimes you want to save time and get some ideas. So, I recommended the circuits with PCB lists below. Also, they are easy to build and Cheap. 3.3 3. 78xx voltage regulator—cool! A lot of circuits use a few power. So it can be powered by batteries. This is small and easy to use anywhere. But normally they are lows voltage. They are the best for low current using. You should use rechargeable batteries, to reuse many times to save money a lot. I like my children to use them. Because it is safe for him. We can use it as solar power our circuit directly. We like to use it is a solar charger for a rechargeable battery. My son like to make solar light. We use AC line, its basic is AC Adapter, like a power supply. They are the compact units and easy to use than a battery. We can apply them to various output voltage and currents. When we are in a house. we should use them instead of batteries and solar, it will save our money. We must use it carefully. Safety first! It is many useful but also can kill you! There are many kinds of power supply circuits. But they can all be put into two groups. First, the AC voltage to a power transformer to raise or lower the voltage. Then, Converted to DC voltage. And next, applied to regulator circuit system. It keeps the voltage and current for a load. No transformer—It converts the AC power directly into a DC voltage without a transformer. High frequency—this DC voltage is converted into a high-frequency AC signal. Then, the regulator circuit inside to produce the desired voltage and current. In the table below is comparing various parameters of linear and switching form. I love the linear power supply. Which the switching type is just the opposite. On our site have a lot of the power supply circuit. We cannot show you all. Thus, for saving you time see lists below. You can adjust an output voltage of 1.25V to 30V at 1.5A. I like it. Because… It is easy and cheap. You can use it instead of a 1.5V battery. You often look at this circuit in many appliances. They are a quite old circuit, but so useful. It is very simple with just one transistor, Zener diode, and resistor. The output voltage depends on the Zener Diode. You want 12V supply, you use a 12V Zener diode. You can make. I believe you! They are a popular 1A fixed DC Regulator, easy and cheap. If you need 5V 1A supply for a digital circuit. We usually use LM7805 here. I sometimes need to use 3A variable voltage source. LM317 cannot help me, easily. In a short time, we use LM350T. 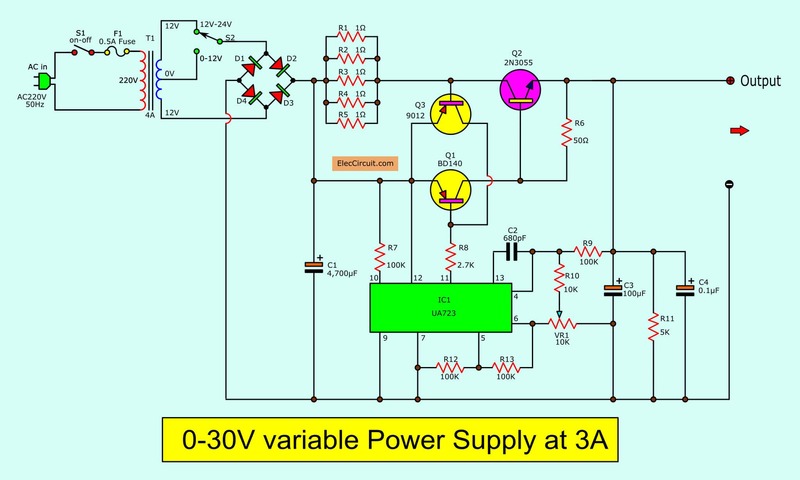 We seldom use 3A Current that can adjust 0V to 30V output. This is a better choice. It uses LM723 as the famous regulator IC. And here is modern design circuit, full protection than LM350T. If you need to use voltage output over than 30V or adjust 0V to 50V. You can use it. They have the key components, LM723, and the higher voltage 2SC5200 transistor. You can build it easy and cheap to learn more. These are DC switching power supplies. To be ideas on building the projects or tools. Because they have a small size and cheaper than the linear power supply. My site begins to have many circuits. Until friends said that difficult to see circuits or projects as he wants. 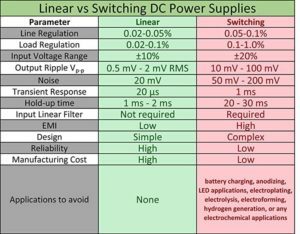 Particular DC switching power supply has very useful. The list below are ideas to build the great power supply that small and saving money. For application or learning. I so collect these circuits for ease of accessing the projects that I interested in. Also, they may be useful for you, too.